Are you looking for an incredible professional development experience for your teachers? I offer high quality gifted and talented professional development sessions for educators, as well as parent and youth sessions. These titles and descriptions are provided to allow session organizers to choose sessions that will work best for them. Sessions indicated with an asterisk (*) are appropriate for parent audiences. Sessions for narrower audiences, including 2e, are listed under Special Sessions. Sessions for youth are listed under Youth Sessions. If you need help selecting the perfect sessions for your event, please feel free to email at lisa@lisavangemert.com. This session, created with Ian Byrd, explores the intricate and interesting connections amoung creativity, critical thinking and curiosity and delves deeply into how to integrate theem into classroom practice. Hold on to your hats or Lisa might just do a trick with them! This workshop is non-stop engagement from beginning to end. Participants learn all kinds of tools of the trade in how to use humor and creativity to improve classroom environment and performance. Even shy teachers will learn low-impact ways to invigorate their classrooms. Fill your toolbox with the most popular and effective strategies that will infuse classrooms with one of the most critical skills for gifted learners: creativity. Length: 1, 2, 3, or 6 hours. Moving even further into the reach of critical thinking’s practical applications in classrooms, this workshop builds on the practical guide of part 1, leading teachers through more strategies. Dive deeply into the techniques and practices that facilitate critical thinking in students. (This workshop may be taken as a stand-alone session. Attendance at the first part is not required). Hands down the most popular workshop Lisa presents, this is a treasure of practical strategies any teacher can use to infuse creativity into the classroom. Lisa shares twelve tools and techniques any teacher can easily use that will improve student performance and enhance the classroom experience for teachers and students alike. Looking for a great way to create authentic audience for student work? Ready to invite real-world applications? Classroom blogging may be just what you’re looking for! This session shares the nuts and bolts of how to get students blogging, how to protect privacy, how to use your own blog for professional development, rubrics and more. I’ve successfully facilitated student blogging for years, and I’m sharing all of my secrets. Teachers need tools! This workshop shares 30 tips and tools teachers can use in their classrooms immediately. A blend of technology and solid, research-based techniques, the tools shared will have teachers itching to try them out right away. Looking for a great way to create authentic audience for student work? Ready to invite real-world applications? Would you like to know how to meet cognitive and affective needs in a single strategy? Join in for a fast-paced look at three strategies to bring any classroom to life. This session shares the nuts and bolts of all of the strategies, shared by a teacher who’s actually done them all in a real, live classroom with tremendous results. This is the thorough training to onboard educators to the Depth & Complexity framework that allows for immediate implementation. In addition to an in-depth understanding of Depth & Complexity, the session shares literally dozens of content-specific examples, as well as ideas for activities and how to introduce the framework to students. After the session, participants will be able to apply the framework in their classrooms to raise thinking level and differentiate instruction. Three Days: All of Two-Day session content, with a follow-up day at least six weeks after integration to explore and resolve issues, questions, suggestions, and to refresh and solidify the practice. Wondering how to address the required standards while retaining your integrity as an educator and doing what’s best for your students? Depth & Complexity pairs perfectly with all content standards, and this session empowers educators to use the framework as a lever to lift their content to meet any standards system. Looking for a one-stop shop for raising the thinking level of students in your classroom? Look no further than Depth & Complexity. This session will provide a helicopter tour of the framework, sharing the fundamentals of how it works in real, live classrooms. This session is designed for educators with little or no experience working with the framework. Love the richness of the Depth & Complexity model, yet wondering how to do more than just share the pictures, questions, and framing? Come participate in this active workshop that will guide you through a session designed to take your DepCom skills to the next level. Wondering about the best way to introduce the icons to your students? This session offers three different possibilities for sharing the framework with students. One of them is sure to meet your own teaching style and the needs of your students. This session is designed for educators with little or no experience working with the framework. Would you like to know how to do more than just insert pictures of the icons next to questions? This session shares a buffet of ideas for classroom activities using the Depth & Complexity Framework. There will be ideas for all grade levels and content areas. Participants are encouraged to bring topics they teach – they’ll be able to find out activities they can use for that particular content. Prepare to be surprised. Although differentiation is the key to effective service of gifted students, it is one of the least understood principles in education. Because it encompasses such a wide variety of strategies and has a specialized vocabulary, many teachers feel overwhelmed just thinking about it. Join us for a strategy-rich tour of differentiation, from its fundamental roots to its practical (and do-able) application in the classroom. Find out the easiest (and most effective) ways to differentiate for all learners. You will leave feeling more confident about differentiation and ready to try it (or delve deeper) in your own classroom. Created with Ian Byrd, this workshop is differentiation on steroids. It’s how to take differentiated practice to the next level by implementing four strategies. Learn how students can take content every which way but even loose in order to allow for differentiated practice in the GenEd classroom. Leave with strategies you can use tomorrow, as well as those you can develop into deep practice. If you think you’ve seen it all, try this. Are you looking for effective ways to differentiate that won’t break your time bank? This session shares a literal alphabet soup of ideas for a broad range of grade levels and content areas. You’ll find ideas you can do tomorrow, as well as those that will become your go-to strategies for years to come. Meet the needs of your students, both cognitively and emotionally, with far less effort than you thought possible. This workshop answers the question, “Can you become a better teacher?” in the affirmative, sharing ten tips to turn any classroom into a more effective learning environment. The simplicity of the ideas makes them easy to implement. The research behind them makes them invaluable. Would you like to learn ways to move students in and out of groups flexibly and effectively? Would you like to know what the research says about productive grouping? This workshop explores grouping in the real world classroom in a way that builds camaraderie and saves time. Take away great ideas and an understanding of when to use what! Ready to move to Differentiation 2.0? Heard about tiered instruction and wonder what it looks like in a real, live class with actual students? Join in and find out what it is, what it isn’t, and the hacks you need to make it seemless and integral part of your classroom. If you’re ready to take your differentiation skills to a new level, this is the session for you. 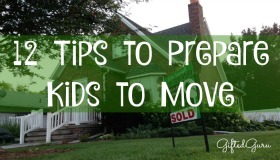 Students of all ages work better and more effectively when they move frequently. Find out how (and a little about why) to integrate this into your class without losing control. Find strategies for micro and macro movement opportunities, and learn how much of the work has already been done for you! This wildly popular session shares strategies for educators and students alike. An entire alphabet of pre-assessment strategies teachers can implement right away, this session is a perfect deeper dive into differentiation. Participants will understand when to use pre-assessments, how to do them, and what to do with the data. This popular session is perfect for teachers ready to take the next step in differentiation. Would you like to know how to create engaging, compelling presentations? Join two self-professed PowerPoint snobs to learn insider tips on the technology you need, the platforms you can use, and the sources that will help you become a presentation rock star. Turn your classroom into a model of presentation power. This presentation was designed by Lisa and Brian Housand. They’re not just for social and emotional needs anymore! This session shares how educators can use intensities across the curriculum. Character analysis? Check! Evaluating the Periodic Table? Can do. We’ll emphasize language arts, but promise something for every content area. Intensities and Overexcitabilities are well known in the social and emotional domain of giftedness, but Lisa and Ian turn it around and use it as an analysis tool, allowing youth to see their own intensities as a strength and aspect of their depth of character, rather than a weakness. Attendees will learn not only how to introduce the intensities to youth, but how to apply that to curriculum, using them as a tool for high-level thinking and analysis. The session explore examples of each intensity in multiple literary works, and extend beyond literature to science, social studies, mathematics, and the arts. This session was designed with Ian Byrd. Who are they and how do we find out? 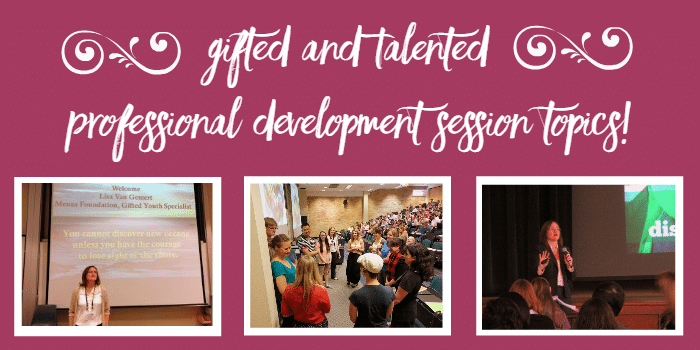 This session, part of the initial 30-hour introductory course for teachers, explores what it means to be identified as gifted and how the definitions arose. Participants will understand the different tests given and what they show (and don’t). They’ll be able to explain standard deviation and interpret multiple assessments. This session provides a strong foundation for understanding what it means to be gifted . Want to know how to develop a state-of-the-art ID process? Want to avoid common pitfalls that mire districts in red tape and complaints and other difficulties? We’ve got you covered with this workshop that shares specific instruments, as well as general policy considerations. It’s a consultation-in-a-box, and it’s well worth your time. Explore the roots of some of the special needs faced by the gifted, how society views the gifted, and ways in which teachers can help students strengthen themselves socially and emotionally. Find out what “intensity” means in relationship to gifted children, the necessity of cultural awareness, and the five tricks every teacher of the gifted needs to survive. Using books and film representations of gifted learners, this workshop is one of the most popular Lisa presents. This workshop explores the idea of what it means to be gifted and the specialized nature of the gifted brain. Participants will explore historical and contemporary theories of giftedness and the dynamics of the gifted in an inclusion classroom. One of the most popular parts of the workshop is an exploration of contemporary brain research and its implication for the gifted. The needs of culturally and linguistically diverse gifted learners are explored, with specific ideas shared for how teachers can understand a child from any culture. The workshop ends with Lisa’s popular & practical perfectionism session. Length: 6 hours. The sections on perfectionism and the brain can be separated out into one hour individual sessions. What can schools and teachers do to effectively address suicide among gifted schools? What are the “first, do no harm” guidelines we should follow? This session confronts the complicated issues of student suicide, empowering educators with the information they need to appropriately discuss the issue with gifted students at various ages. Educators gain the skills they need to address the issue if it happens on their campuses, and they explore the intersection of suicide with giftedness. Cooperatively developed with a therapist specializing in gifted, this is a teachnique-based, practical session. Do you have students or children who struggle with perfectionism? Perhaps you do yourself. Would like practical ideas for helping overcome it? Perfectionism is an occupational hazard of giftedness, and its effects can be truly debilitating. Learn what perfectionism looks like in gifted kids, its potentially damaging effects, and then take a deep dive into the big ideas and strategies for turning this terrible master into a compliant servant. 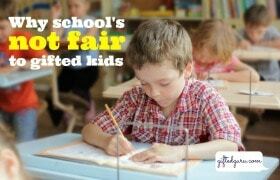 Ever wonder what to do with a gifted child not living up to his or her potential? Learn the secrets behind enhancing achievement drive in gifted students. What does the research say? Find out the pitfalls of rewards, and take away seven strategies you can use right now to light the fire within any child. They’ve got the smarts, and sometimes even the desire and drive, yet somehow they never get the train up the mountain. They’ve got the ability, yet if they can’t do it right the very first time, they don’t even want to try. What’s going on? Join us as Lisa Van Gemert, the Gifted Guru and author of Perfectionism: A Practical Guide to Managing Never Good Enough, explores exactly why our gifted youth struggle with risk avoidance and underachievement. Take away practical ideas, and maybe even a little paradigm shift. While gifted youth need more leeway and independence at earlier ages than do their typical learner peers, that doesn’t mean they need less parenting. Identifying and sustaining appropriate boundaries with peers, adult interaction, and even electronics can challenge the best and most dedicated of parents. Using a metaphor of fences, learn the key ideas parents need to find and maintain suitable guidelines for their children without dampening the child’s spirits or feeling like they’ve surrendered all control to their kids. This session was designed with Dr. Dan Peters, Executive Director of the Summit Center. Four conditions account for the majority of mental health issues experienced by young people. Explore how the issues of ADHD, mood disorders, depression, and conduct disorder impact schools, what these issues look like in gifted youth, and how to recognize and handle them. Teachers won’t want to leave when this Social and Emotional Needs update ends. Chock-full of team-building ideas, practical tips, and including wonderful, inspiring stories, teachers will return to class ready to meet the needs of their students, cognitively and emotionally. Taking a page of out Lucy’s playbook from Peanuts, we’ll explore some tips and tricks for embracing five-minute opportunities to meet the needs of students. Get dozens of resources and strategies you can use to get a read on your students, calm a tense moment (even if it’s your own! ), and deepen your relationships to make the classroom safe. What are the most vital things everyone need to know about what brain research has to say about the brain? The Gifted Guru will share ten key things you need to know to be in the know. Learn the key structures of the brain important in learning (and why one of them is causing fights on campuses and in families). Discover the reason kids under stress can’t learn and how to help. Uncover the science behind giftedness and what it has to tell us about typical learners, too. Embracing the idea that gifted children need to be seen as whole people, not merely a high-ability brain, this workshop leads teachers through the fundamentals of what research tells us about the importance of emotional intelligence and how we can build it. Using contemporary studies and pertinent anecdotes, this workshop will have teachers learning more about themselves and their students. Educators and parents who work with the gifted will face the ugly reality of hearing the phrase “I’m bored” frequently. Ironically, boredom is fascinating, and this workshop (one hour) explores what makes people bored, why some people get bored while others don’t, and what teachers and parents can do to mitigate boredom and its negative effects. Healthy, effective self-concept promotes achievement and life satisfaction. Telling kids they’re smart and/or pretty is the entirely wrong way to go about creating this. This engaging workshop focuses on specific, research-proven tools that build self-confidence and self-concept in learners. Join us for a peek inside the complicated brain of the twice exceptional student. We’ll explore identification practices and issues, as well as classroom interventions and possible, practical accommodations. This full-day workshop explores issues in identification and service, as well as experience in developing intervention plans. Note: This session requires that all participants have a device and internet connectivity. This fast-paced, practical course gives administrators the tools they need (including a specially designed walk-through form) to observe GT strategies in the classroom. Administrators will learn the power of best practices in observation and discover the paradigm shift that will transform the way they assess teachers. How can districts provide quality, effective PD without breaking the bank or teacher revolt? Learn strategies and models for delivery of PD. Find out what’s new, what’s working, and what should be abandoned. Leave with a plethora of ideas and a great PD record form for teachers. Learn the strategies that work (and don’t) with gifted students who have dyslexia (or any reading/writing difficulty). This practical session emphasizes respecting ability while acknowledging challenges, and shares useful, useable take-aways that can benefit a wide variety of students. It can be done. No, really. This session addresses diagnosis complications, as well as what ADHD looks like in the classroom (like you didn’t know), as well as specific ways to support students that can actually be done. While nothing is guaranteed, this session will get you started on your way to effective support. Go beyond “hard” and get to effective in the ELA classroom using differentiation strategies that really work. Look at Depth & Complexity specifically from an ELA perspective. Find out how to get writers to revise their work, even when they think they don’t need to. Discover how to help students become content disciplinarians. Learn the power of a great transition words, and be able to share with students the cognitive ability markers in the realm of Language Arts. This three-hour workshop is practical, research-based, and a perfect drag-and-drop-into-use session for ELA teachers (and it’s got a meaty handout,too). Kindergarten is special, and this session shares everything Kindergarten teachers need to know to be able to teach students and reach parents. Kindergarten teachers thrive in professional development sessions designed just for them, and this one is it! Great resources and strategies, as well as the cutting-edge in research combine to make for a wonderful and very popular session. Do you worry that virtual reality is becoming your child’s reality? Do you struggle to balance your children’s desire to play video games with other pursuits? How much is too much? This session shares a close-up view of what the research is telling us about best practices for families in the digital age. You’ll learn the tips and strategies you need to hack parenting the digital native. What does it really mean to be smart? What should a kid’s next steps be to take control over their minds in powerful, effective ways? This interactive workshop uses the word “smart” as an acronym to take students on an exploration of the gifted mind from an owner’s perspective. They act out the science of smart, learn to manage their minds mindfully, act appropriately, reflect, and learn the best thinking practices for helping your ability match your outcomes. What can youth learn from the characteristics of a hero in order to learn to become heroes in their own lives? Seizing on their strengths, recognizing the powerful forces in their favor, learning their place in the world, and understanding just what it means to be a hero can increase motivation and a sense of empowerment. If you are interested in scheduling a session or have questions, please email Lisa or call 682.472.6127.